Every Tuesday at 2 p.m. Eastern, Jeff De Cagna (@pinnovation) — or an occasional guest facilitator — leads an hour-long Twitter chat about hot topics in the world of associations. The launch of Association Chat’s new blog, just this morning, makes it easier than ever for association folks using Twitter to connect with their colleagues, or just follow the conversation and stay in the news loop. Visit the new blog at http://associationchat.posterous.com. Grab the RSS feed to get updates in your feed reader of choice, or one-click subscribe to the blog in your Posterous account, if you have one. See our Introduction to Twitter Hashtags for more information on what hashtags are for and how you can use them to follow conversations of interest. 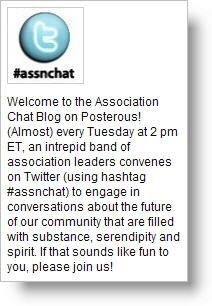 Participate in the weekly #assnchat in real time. Kiki L’Italien’s short YouTube video gives clear and specific instructions for using Tweetchat to take part easily in a Twitter chat. An Idea for Other Types of Non-profits to Explore? Could your own organization and its chapters (or a network of nonprofits that share a common cause) get together to do something similar, to help amplify your own online message? This post was mentioned on Twitter by johnhaydon: Association Chat (#assnchat) Blog Launched http://bit.ly/8fUpeq by @rjleaman - RT! Our organization, Opportunity International launched a similar chat 6 months ago called #Mifimon. It takes place every other Monday from 12-2pm CST. We meet and discuss microfinance an its role in alleviating poverty.